No fancy ingredients required or browning any meat for this simple stuffed peppers recipe! These stuffed bell peppers are my ultimate favorite way for stuffing peppers and it’s done easy! 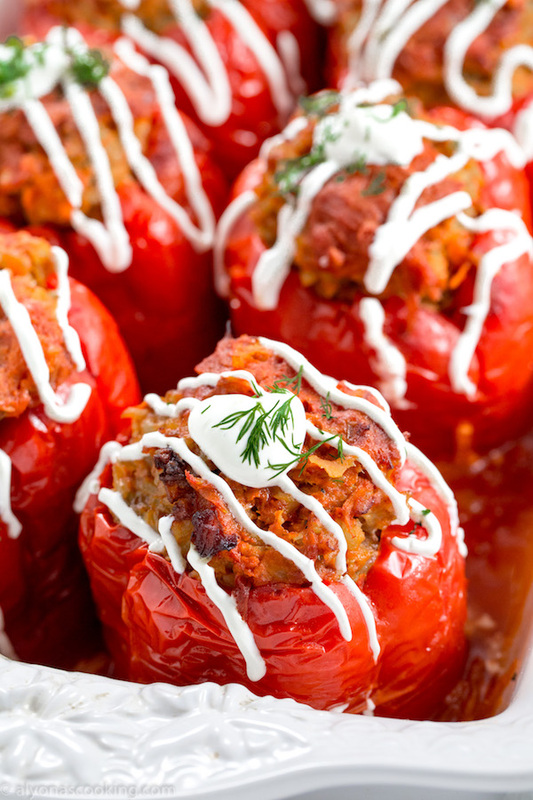 Filled with a meaty rice mixture and smothered in a simple tomato sauce these peppers may just become your families favorite! I published this recipe back in 2015 and a re-post is totally worth the effort. I absolutely love this pepper recipe! It is THE recipe I turn to when I want to make stuffed peppers. Shared by Lubasha years back, I still favor this recipe. It’s a really simple recipe and the tomato sauce can be substituted for so many other tomato variations, like jarred spaghetti sauce or diced tomatoes, V8 juice, diced tomatoes or tomato paste diluted with water–all make substitutes for the tomato liquid. It’s such a versatile recipe as you can also change up the meat or rice (I’ve used a mixture of uncle Ben’s brown rice and jasmine.) This dish makes a great alternative to golubtsi but minus the cabbage prepping. 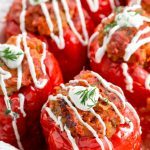 My favorite stuffed peppers recipe! 1. Bring 1 1/2 cups of water and rice to a boil. Reduce heat and cook over low heat for 15 minutes. Set aside to cool. 2. Saute the onions and carrots in 7 TBSP of oil until soft (about 7 minutes.) Add in the tomato sauce, sugar, salt, pepper and vegeta seasoning and heat thoroughly. 3. In a large bowl, combine the rice, ground pork and half of the tomato sauce mixture. Pack mixture inside each pepper and place into a baking dish. 4. Delude 1/4 cup water into the remaining tomato sauce and pour over the tops of the stuffed peppers. Cover and bake in a 400° oven for 1 hour then reduce temperature to 325° and bake for an additional hour. Serve with a dollop of sour cream. No fancy ingredients required or browning any meat for this simple stuffed peppers recipe! These stuffed bell peppers are my ultimate favorite way for stuffing peppers and it's done easy! Filled with a meaty rice mixture and smothered in a simple tomato sauce these peppers may just become your families favorite! Bring 1 1/2 cups of water and rice to a boil. Reduce heat and cook over low heat for 15 minutes. Set aside to cool. Saute the onions and carrots in 7 TBSP of oil until soft (about 7 minutes.) Add in the tomato sauce, sugar, salt, pepper and vegeta seasoning and heat thoroughly. In a large bowl, combine the rice, ground pork and half of the tomato sauce mixture. Pack mixture inside each pepper and place into a baking dish. Delude 1/4 cup water into the remaining tomato sauce and pour over the tops of the stuffed peppers. Cover and bake in a 400° oven for 1 hour then reduce temperature to 325° and bake for an additional hour. Serve with a dollop of sour cream.